A Water Heater heats up the water that is used in the plumbing for your sinks, baths, and showers. A Water Heater is different than a Furnace or Boiler, which are part of the central heating system for your home. If your Water Heater is heated by electricity, then you should put a checkmark for Water Heater (electric) in your Home Wizard app, unless it is a special type of electric water heater called a 'tankless' system. A 'tankless' system only heats the water when it is actually used, where a Water Heater (electric) heats up the water in advance, so it is available when it is needed. If you have a 'tankless' Water Heater, then you should put a checkmark for Water Heater (tankless) in your Home Wizard app. If your Water Heater is gas-fired, then you should put a checkmark for Water Heater (gas) in your Home Wizard app. And if your Water Heater is oil-fired, then you should put a checkmark for Water Heater (oil) in your Home Wizard app. And if you have a HydroAir system in your home, then your Boiler will be the source of heat for your Water Heater, and you should put a checkmark for Water Heater (HydroAir) in your Home Wizard app. 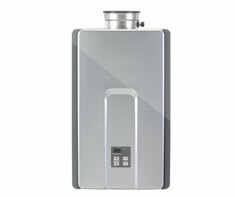 Hot water heating is typically the third largest energy expense in a home, after space heating and cooling. In addition, a water heater is a relatively expensive appliance, and it operates under very severe conditions (high temperatures, and cycling on and off). Proper maintenance can significantly improve the energy efficiency, service life, and safety of this appliance. Basement, CO Detectors and Furnace (gas). Shown in the 'Routine Care' section are the recommended routine maintenance tasks for your water heater (tankless). The 'Q & A' section shows answers to common questions. And the 'Articles' section provides helpful articles about your water heater (tankless).